Our plastic chain and posts are incredibly versatile and suitable for external and internal use. The range includes plastic posts with low profile rubber bases for indoors, to sturdy concrete, water or sand-filled bases that are weather-proof and perfect for outside. 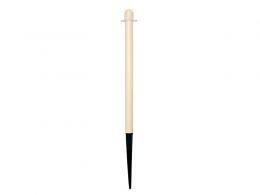 In addition, we stock plastic ground mounting posts that are designed to provide support for post and chain garden fencing. Kitting out an entire venue? Shop for our plastic chain and posts kits and get free delivery on all orders! Plastic chains and posts are one of our most popular products. Not only are they incredibly versatile, they are suitable for external and internal use and come in a wide range of attractive colours. Read our article on putting up plastic chain garden fencing. Our plastic chain is very lightweight and, as it has been UV stabilised, fade-resistant meaning that the colours will remain bright and vibrant for many years. In addition to this, the polyethylene construction ensures that the chain will never become brittle, even if left outside for extended periods of time. The plastic posts are also available in a variety of colours whilst the differing base types make them suitable for both internal and external use. The low profile rubber bases are ideal for use inside as they are non-marking and pose a reduced trip hazard. The concrete and water/sand filled bases are perfect for use outdoor as they provide a sturdy, wind-proof, base for your posts to cling onto when the weather gets rough. If you are looking to kit out your entire venue, then it's worth having a look at our ready-made plastic chain and post kits. These plastic chain and post bundles are fantastic value for money and include everything you could need; chain, posts, bases and connectors, which are all available in a variety of co-ordinating colours. Plastic chain is widely used in businesses that are open to visiting members of the public, for example hotels, country clubs, pubs and golf clubs. They often use large lengths of the chain along with ground fixed posts – the type of post that can simply be hammered into soft ground like grass. 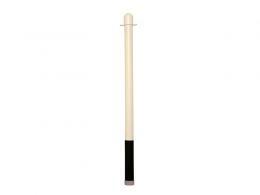 The plastic posts are likely to outlast wooden equivalents, not to mention the fact that they are easier to install. Frequently car parks use the chains to cordon off flower beds, trees or grass areas - they make a simple and attractive barrier. The Workplace Depot’s plastic chain is made from polyethylene, which is a high density plastic that can be recycled. It also has the benefit of not going brittle and has some degree of ‘stretch’ in it so if it is knocked or trodden on it won’t necessarily snap! Our plastic chain is UV stabilised to reduce any colour fade and is resistant to cold temperatures. 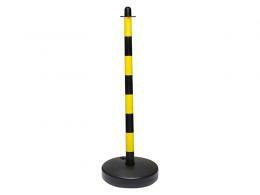 When the plastic chain is used indoors you will require free-standing posts, usually with a low profile, rubber base. 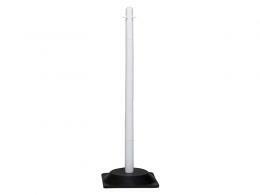 There are outdoor free standing posts available which have either rubber, concrete or water weighted bases. There seems to be a growing number of airports, colleges, car dealers and stately homes using the chain both indoors and out. Turning to the chain itself, it comes in 7 colours (white, red, black, yellow, green, yellow/black and red/white) as well as several multi-colours namely red & white, yellow & black and the colours of the Union Jack, (red, white and blue). For large orders it is possible to get other colours produced for you.